It is a fluid mosaic of lipids, proteins and carbohydrate. The plasma membrane is impermeable to ions and most water-soluble molecules. 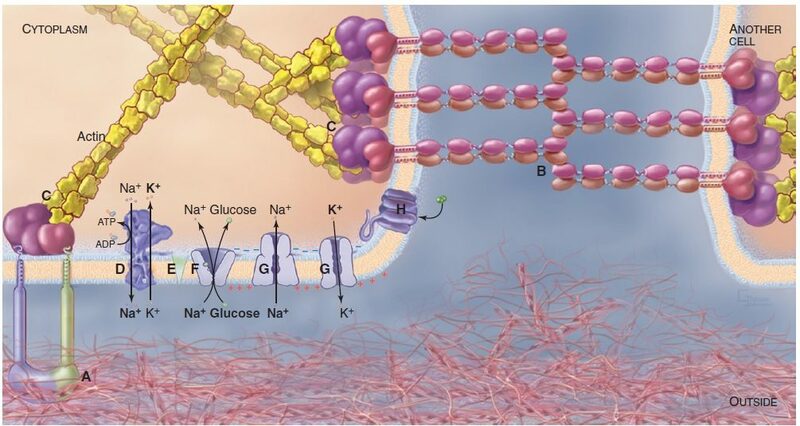 They cross the membrane only through transmembrane channels, carriers, and pumps. These transmembrane proteins provide the cell with nutrients, control internal ion concentrations, and establish a transmembrane electrical potential. A single amino acid change in one plasma membrane pump and Cl− channel causes the human disease cystic fibrosis. The cell membrane is primarily composed of a mix of proteins and lipids. 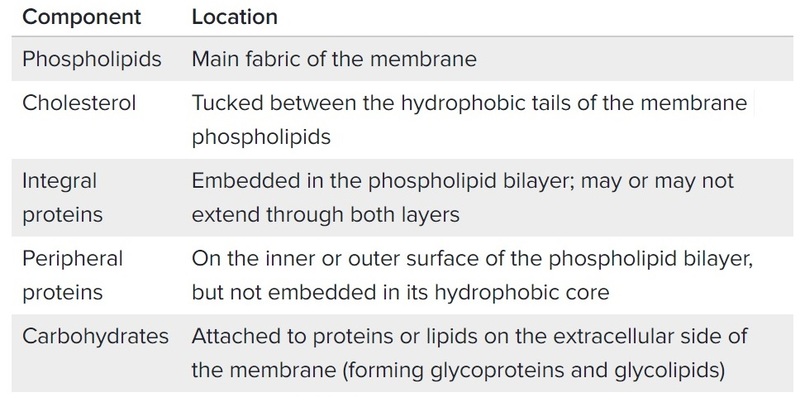 Depending on the membrane’s location and role in the body, lipids can make up anywhere from 20 to 80 percent of the membrane, with the remainder being proteins. While lipids help to give membranes their flexibility, proteins monitor and maintain the cell’s chemical climate and assist in the transfer of molecules across the membrane. The fundamental structure of the membrane is the phospholipid bilayer, which forms a stable barrier between two aqueous compartments. The plasma membrane is composed of a phospholipid bilayer, which is two layers of phospholipids back-to-back. Phospholipids are lipids with a phosphate group attached to them. The phospholipids have one head and two tails. The head is polar and hydrophilic, or water-loving. The tails are nonpolar and hydrophobic, or water-fearing. Figure: Structure of Plasma Membrane / Source: Cell Biology, Thompson D Pollard, et. al. The primary function of the plasma membrane is to protect the cell from its surroundings. The plasma membrane also plays a role in anchoring the cytoskeleton to provide shape to the cell, and in attaching to the extracellular matrix and other cells to help group cells together to form tissues. The membrane also maintains the cell potential. The cell membrane interacts with the cell membrane of adjacent cells e.g. to form plant and animal tissues. The cell membrane is primarily composed of proteins and lipids. While lipids help to give membranes their flexibility and proteins monitor and maintain the cell’s chemical climate and assist in the transfer of molecules across the membrane. The lipid bilayer is semi-permeable, which allows only selected molecules to diffuse across the membrane.